Scan the vehicle VIN barcode using the autofocus camera on iphone 3GS or newer. Or use the keyboard to enter the VIN on devices without an autofocus camera. The Year, Make, Model, Engine and Equipment will be displayed. Add the Color, Mileage, Price, Stock# and any Notes. Add or change equipment items. Use the camera or the photo album to add up to 3 photos. View a full-size photo of the vehicle. Save to your Vehicle List. Edit the info anytime. 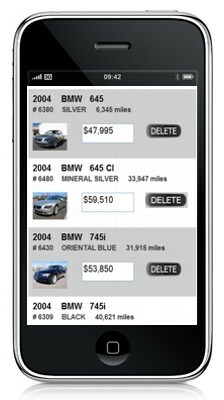 Sort your vehicle list by Year, Make, Stock# or Price. Send an email of the vehicle, including the photos & equipment list. A Great Way to Keep track of all of your vehicles.